Rapid Recovery Service is ready to assist you with all emergency Roof Repair – Tarping as a result of heavy rains, wind, hail damage, storm, fire, etc. We have a vast array of solutions for stopping leaks and repairing damage. Whether you require a minor repair or a complete roof replacement, Rapid Recovery is standing by to provide you with excellent customer service and craftsmanship. Because the roof is one of the most critical parts of a house and directly affects the integrity of the entire structure, prompt action is necessary to prevent further destruction. For example, water leaks can damage the internal structure, ceilings, insulation, electrical system, and walls which can then lead to mold growth. 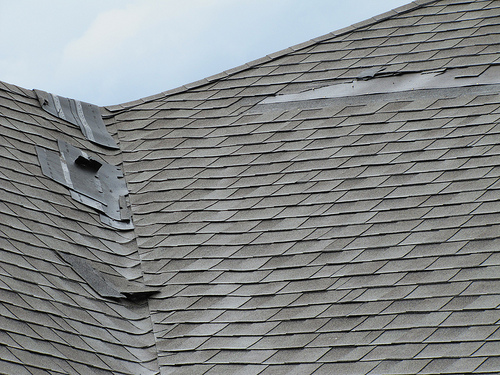 Roofing damage due to storm related conditions is a normal cause of loss and should be covered by your home owners insurance, including the cost of getting help in an emergency in order to stop further damage to your property. Do not attempt this project alone in case of injury. Do not walk on a damaged roof until you can pinpoint where the damage is. Do not walk on the damaged area. It could be unstable. Never stand on a tarp on a roof, especially if the tarp is wet. Do not climb up onto a roof during bad weather. Never stand on a steep-pitched roof. If your roof is damaged from the winter storms, hail storm, hurricane, tornado, by falling branches or debris, or other incident, your homeowners insurance policy may cover the cost of repair or replacement. Here are some tips on filing an insurance claim that can help to speed the process and get your roof restored quickly. If you spot a drip coming through your ceiling check for roof damage directly above the leak. If you don’t spot physical water but still think something is amiss look for signs of a roof leak which include a black marks or water staining in the ceiling. 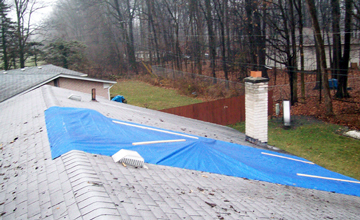 You’re more likely going to find the leak with a roof that has a small slope or is flat then a highly vaulted roof. If you have an attic grab a flashlight and crawl up there to check for black marks, mold or most commonly water stains. Each of these are common evidence of an apparent leak. The source of the leak will likely be near. 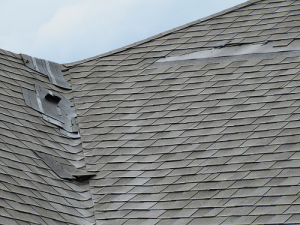 Look for damaged or missing shingles near the suspected leak area. Any exposed roofing tacks will also be a sign of trouble. If shingles easily come off the roof, or if they break or crumble when they are touched then you’ve likely found the spot of the leak. If this happens all over the roof it may be time for roof replacement. Look at the areas near roof penetrations, such as vents, chimney or pipes. These areas are more commonly subject to damage because they stick up from the roof and will catch debris in wind. If these areas get damaged they may unfortunately require expensive repairs.